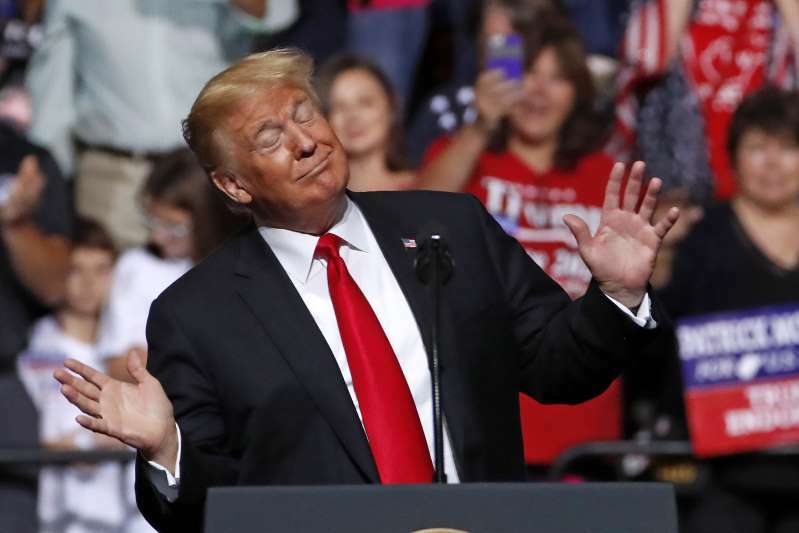 © Gene J. Puskar/AP President Trump reacts to the playing of West Virginia’s state song as he takes the stage during a rally in Wheeling, W.Va., on Sept. 29. On the road again, and full of indignation about, or perhaps admiration for, what he called “made-up” and “fabricated” Democratic accusations during the recent judicial confirmation turmoil, America’s feral president swerved into a denunciation of a nonexistent bill — “It’s called ‘the open borders bill’ ” — that, he thundered, “every single Democrat” in the Senate has “signed up for.” Now, before you wax indignant, if you still bother to, about such breezy indifference to reality, you must remember this: President Trump is guilty of much, but not of originality. Although 2018 has 2½ more months in which to provide redundant evidence against belief in progress, it is not too soon to award the trophy for the year’s most cogent distillation of urgently needed thinking. It is this: “We don’t mail Elvis a Social Security check, no matter how many people think he is alive.” No. Matter. How. Many. Modernity began when humanity “removed reality-making from the authoritarian control of priests and princes” and outsourced it to no one in particular. It was given over to “a decentralized, globe-spanning community of critical testers who hunt for each other’s errors.” This is why today’s foremost enemy of modernity is populism, which cannot abide the idea that majorities are not self-validating, and neither are intense minorities (e.g., the “Elvis lives” cohort). Validation comes from the “critical testers” who are the bane of populists’ existence because the testers are, by dint of training and effort, superior to the crowd, “no matter how many” are in it. “Think,” says Rauch, “of the constitution of knowledge as a funnel”: “At the wide end, millions of people float millions of hypotheses every day. Only an infinitesimal fraction of new ideas will be proven true. To find them, we run the hypotheses through a massive, socially distributed error-finding process. Only a tiny few make it to the narrow end of the funnel.” The authors of those that do receive the prestige of recognition — and the enmity of populists, who worship the many in order to disparage the few. Disparagement is the default position of all levelers. Rauch surely knows that he stands on the shoulders of Friedrich Hayek. Hayek recommended to governments epistemic humility and preached the superiority, and indispensability, of markets, society’s spontaneous order for gathering dispersed information and testing it. Rauch says Trump’s “trolling of the American mind” has enjoyed “the advantage of surprise.” But as this diminishes, the constitution of knowledge can prevail because, although trolling has “some institutional nodes” (e.g., Russia’s Internet Research Agency and Trump’s Twitter account), they are, over time, much inferior in intellectual firepower to the institutions of the constitution of knowledge. Ominously, in the most important of these, the colleges and universities, serious scholars “are not the dominant voices.” Trump, bellowing “fake news” and “sham” this and “rigged” that, is on all fours with his leftist, often academic and equally fact-free despisers who, hollering “racist” and “fascist,” are his collaborators in the attack on the constitution of knowledge. “No wonder,” Rauch writes, “much of the public has formed the impression that academia is not trustworthy.” Imposing opinions and promoting political agendas, many academics have descended to trolling, forfeiting their ability to contest he whom they emulate.